World Wildlife Mexico in collaboration with SEMARNAT and CONANP and the Monarch Butterfly Biosphere Reserve (MBBR) announced the total forest area occupied by overwintering monarch colonies early this morning in Mexico City. Nine colonies were located this winter season with a total area of 1.13 hectares. Although this figure represents an improvement from the 0.67 hectares recorded last year, it’s the second lowest population on record and the third low population in as many years. Populations of this size are extremely vulnerable. Winter storms or poor conditions for breeding in the spring and summer could have a severe impact on a population of this size. 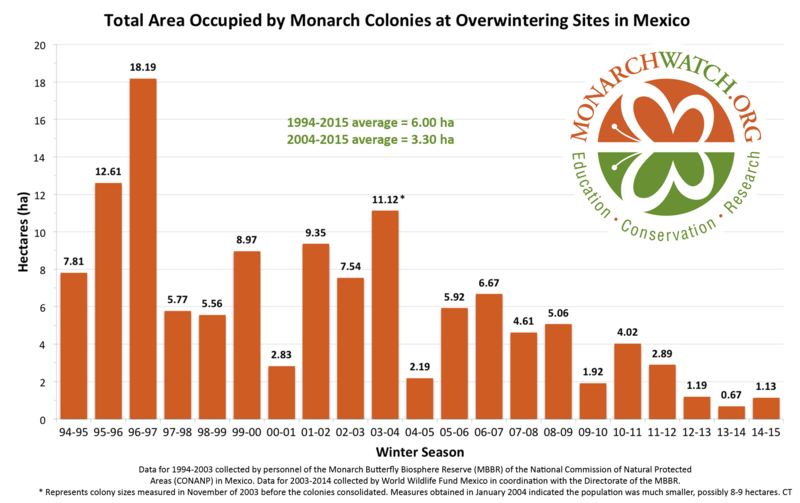 If there are no winter storms in the next three weeks and conditions are favorable as the monarchs move northward in March to Texas, the long range forecasts suggest that the population has a good chance of increasing again next year.